Saving the planet or saving money? David Cameron celebrated 10 years as leader of the Conservative Party this week. The flooding caused by Storm Desmond and his appearance at the international climate change summit (COP21) in Paris provides a neat reminder of the early days of his leadership when he famously embarked on a husky ride to prove his green credentials. Back then David Cameron was trying to detoxify the Conservative brand, using the “vote blue, go green” slogan to make the point. In the years since, the reality of electoral politics set in and the green agenda fell by the wayside. However, the reality of Cumbrian streets under water coinciding with COP21 have given climate change renewed profile. There is general consensus among the public on the issue of climate change. 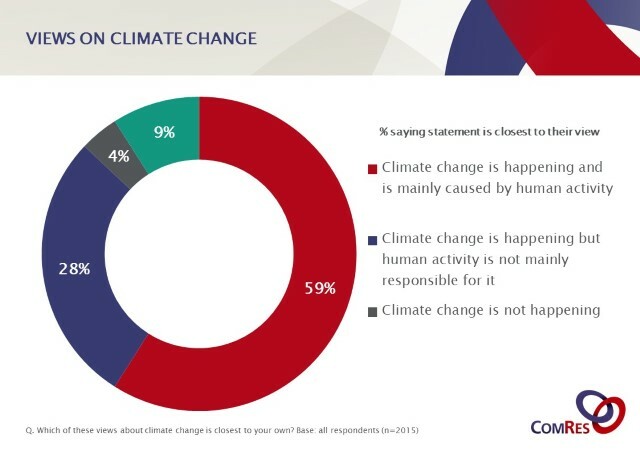 While around a third think climate change is either not happening at all (4%) or that human activity is not responsible for it (28%), six in ten (59%) Britons believe climate change is happening and is mainly man-made. The impact of climate change lapping at our doorsteps can have an impact on our beliefs. 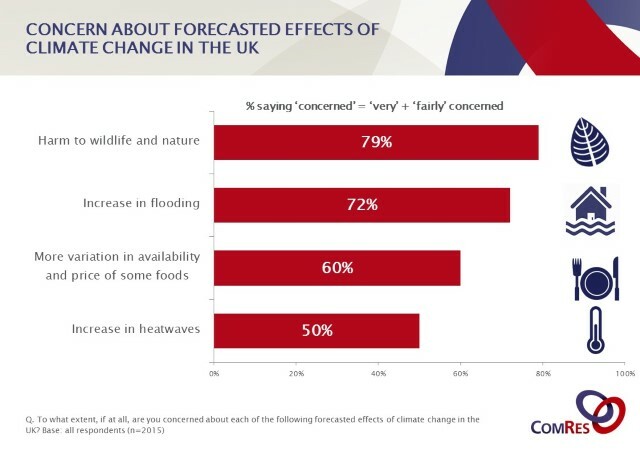 Research conducted after the last serious floods of 2013/14 found people in areas impacted by flooding were much more likely to be concerned about climate change than the general public overall. More than three quarters (78%) of those in areas directly affected by flooding were concerned about climate change, compared to two thirds (68%) of the general public as a whole. More generally however, a greater proportion of Britons are worried about the harm to wildlife as a consequence of climate change than increased flooding. This perhaps explains the viral photograph of an emaciated polar bear, shared over 40,000 times and liked by more than 20,000 Facebook users during the end of August and mid-September, and David Cameron’s photo opp with huskies. What remains to be seen is how the images from Cumbria – including those of the pensioner swimming around his kitchen – impact the nation’s beliefs on the link between flooding and climate change. We know that people are more pre-disposed to taking action when it directly impacts them. Therefore, a strategy that wants to encourage behaviour change around climate change should focus more on the impact on our wallets than on the future of our planet. Research has found that changes in consumption behaviour are significantly more likely to be motivated by cost savings than concerns about climate change. This helps to explain why the vast majority of the British public undertake actions such as always switching off lights when they leave the room (81%) and only filling the kettle with as much water as needed (70%), as these will save them money as well as reducing carbon emissions. If a “nudge” is a small alteration that makes a positive change in behaviour easier – often without people realising, then recycling is a success story where something more akin to a shove has had a positive impact. By offering an easy to use service (kerbside collection or in many areas compulsory sorting of rubbish), regular collections and seeing others doing their recycling has developed it into a ‘social norm’. Now, recycling is considered one of the most effective ways of combatting global climate change by the British public. Around nine in ten say they think it is effective, closely behind planting more trees (88%) and ahead of increasing the use of renewable energy (85%) and improving housing insulation (85%). Until the link between taking action on climate change and real life impact (money saving, or protection against floods) is more engrained in the public’s minds, then shoves and nudges will be more effective than Arnold Schwarzenegger’s call to go part-time vegetarian. For David Cameron and his government, the transition to ‘green’ may need to be more the colour of money rather than the colour of the environment.